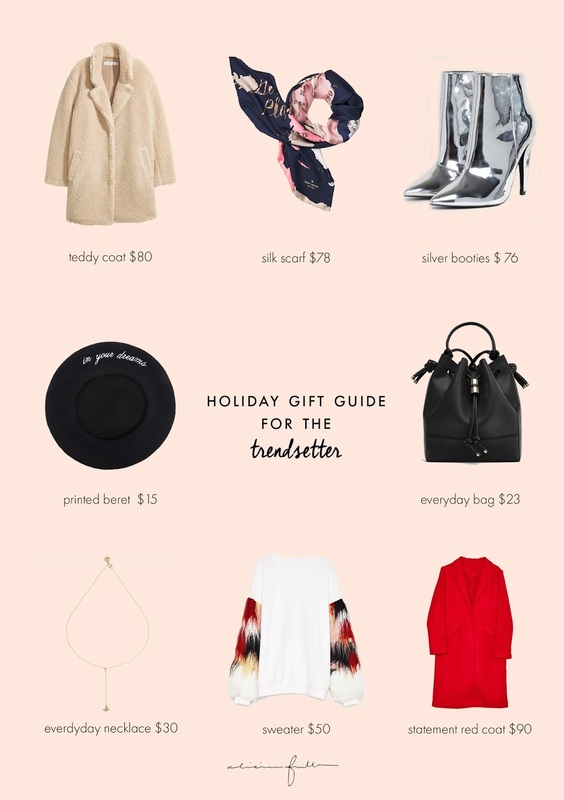 If you’re having a bit of trouble figuring out what to get your most stylish friend for the holidays, I’ve got you covered! These are my top 8 picks for the girl who is obsessed with fashion. A TEDDY COAT is all the rage this season. A SILK SCARF is a super versatile accessory to jazz up any outfit. Statement shoes like these SILVER BOOTIES can really spice up a trendsetter’s wardrobe. On the days it’s not too cold, a PRINTED BERET is the perfect hat to rock. An updated EVERYDAY BAG is always an essential. Everyone needs a piece of jewelry to wear daily. My favorite is a NECKLACE. Your bestie will love this one! Everyone needs a knitted sweater in their closet. This SWEATER will definitely turn heads. The STATEMENT RED COAT is one of the hottest trends for IT girls this season. Your friend will appreciate this find! This post is also featured on Popstar! I write for them every Friday, so be sure to check me out!